We just wrapped up a very exciting time with our Say it, Sweat it, Get it Challenge. If you are considering jumping into the SHRINK SESSION program, NOW is the time to do it. We are offering bonuses GALORE. You can find out about them all here. Only available until this Monday! Are the kind of person who lets setbacks HOLD you back? Do you ever feel like you have tried to make a change or accomplish something so many times that you think maybe it’s time to finally throw in the towel? I don’t know about you, but in the past when there was something I was REALLY excited about, whether it be a new project or a new opportunity, I dove in head first. This was good because I was instantly open and available to ideas, creativity and inspiration (think potential new relationships, new creative gigs or anything else that I had never done before). BUT, the downside of investing my whole heart and soul into these things was that if it didn’t work out, or if it fell apart, I would feel totally defeated. And after each defeat, it would get harder and harder to pick myself up and try again. Can you relate? If you have ever felt (or are feeling right now) hurt, frustrated or angry about something you THOUGHT was going to work out, but didn’t, then I want you to watch today’s video. 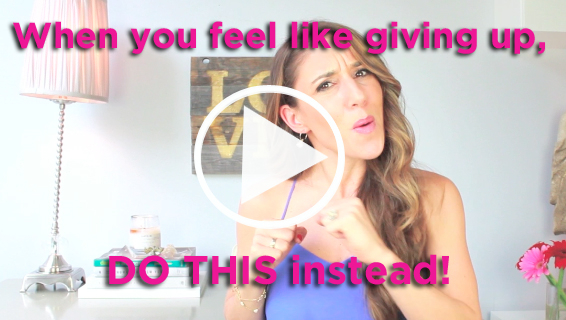 In the video, I share my own recent disappointment (and a little sneaky trick my husband played on me that helped me laugh about it). And then I give you MANTRAS and show you a few easy MOVEMENTS that you can do to help you reconnect to the beautiful dream you started with. Persistence will help you succeed! The idea of reconnecting to your plans, ideas and wants is not just an intellectual one. You must to find a way to FEEL it again. You must physicalize the inspiration in your body. Otherwise, you will be stuck feeling that old wound of defeat and frustration. Together, we are going to MOVE the energy. I also provide you with a handy download that you can print so you have movement and mantras with you whenever you need them. Erin, I LOVE this video! Made my day! Thanks for the movement and mantras! You’re the best! Had to laugh as I watched. I dove back in to the job of getting rid of things from my parents’ house, only to hit some hurdles & detours trying to research antiques. Trust me, I did a similar flop on the bed. BUT, I’ve taken a few deep breaths, shook it off & am sticking with it. Your mantras & movements are perfect for me. Having to adjust some workouts to account for worn cartilage & arthritis (hello older person, where’d you come from?!) but I am re-committed to shrinking & strolling. i love this! It’s so easy to get stuck in the thinking part and not embody the commitment. I do a breath technique with sounding for all 4 realms. Mind~Body~Spirit ~Emotion…. I made it up one morning when I was all freaked out…..now I’m recommitted to share it with the world soon, even though there is the F word in it….Movement, Mantras and Humor….Awesome recipe! P.S. I must watch Game Of Thrones! Oy Vey GoT!!! Hilarious + Awesome video. Loved the mantras they are perfection! Ha! Loved watching your GOT reactions- totally been there myself for other shows. Way to transform that feeling into a great message and video. Love you, girl!!! You are infectious! And adorable and inspiring and gorgeous and I’m proud to know you. You are changing lives with these little pieces of candy for the soul and body. Mine included! I did the mantras and motions! I feel awesome. Thank you! Mwah! Thanks so much for this Erin. I was smiling at the end of it. This is just what I needed right now. Great mantras and movements put together. Love it. Such a brilliant video. I laughed out load. Have had many bed flopping moments in my day!! Love these mantras. Will be using them regularly. Just by doing them along with this video you feel a shift in energy. Thank us so much Erin. You gave me a Tool to change my state of mind : ) …… and it Works! Love your nuggets of inspiration! This one came at the perfect time. I had one thing that came up for me with the mantras. I am sure you have heard of the expression “never say never”. Meaning that whenever you put the word “never” before something you don’t desire, you are actually calling it into your life experience. When the mantra was “I never give up” I felt my mind and body resisting the word “never” and desiring to speak this idea in the affirmative with something like ” I move forward toward my dreams” or ” I remain true to what I love” or “I remain steadfast to my dreams”. Not sure if this resonates with you. I just had to share. Thanks again for what you do. Love your work. shockingly, i did not believe when i started, but it actually generated good energy. it was short and effective and works.